We, who are fortunate to have enough food to eat, spend time thinking about how that food arrives on our tables. We are also concerned about what it does, or at least should, in our personal views, consist. Two of my favorite bloggers have also written about the ethics of eating today. Not only do veteran bloggers concern themselves with food and sustainability, but so do those whose livelihoods depend upon it. Without water, we can grow no food. The privatization of water is a disturbing subject. Water wars and concomitant environmental destruction in the U.S. West and in China, as well as ongoing drought in Africa and the Middle East are ongoing problems. That’s just a random sampling from the buffet, all selected from the too-little-water side, reflecting my San Diego roots. So, what are concerned people to do? Cook and eat at home is generally rule #1. We typically follow this rule, but I wonder about economy-of-scale. If only we had communal cooking facilities. It could be my turn to cook the brown rice for many families this week, and the turn of another to roast vegetables, or…even make beef stew. Composting, wasting little–depression-era style consumption of leftovers is practiced here–buying and eating less of the foods that put the greatest strain on the environment, and participating in a local CSA farm are among the things easier things we do. Those who are not vegetarians (I am a former vegetarian, not so now) can buy and eat less meat. If available and affordable, it is better to buy pasture-raised meats and dairy products from grass, not grain-fed, animals. The best scenario is when these purchases can be made locally, so that the miles to market by the delivery vehicles and shoppers are minimized. Small, local, organic, community-supported agriculture is best. I usually shop at the local grocery store when not at the health food store. When I enter the grocery store, a taxing flowchart weighs heavily on my mind. “No,” I remind myself, “it would be worse to drive fifteen minutes each way to shop in order to buy food from a corporate-owned grocer packaged in compostable containers.” When organic produce is wrapped in plastic on Styrofoam trays, I forgo organic in favor of less packaged produce. The Styrofoam is surely more toxic to the earth than whatever amount of pesticide and herbicide was applied to these two lemons/these two bell peppers is the answer I arrive at through applied calculus. No. I don’t really do calculus, and though flow charts are pretty, and I am sure an engineer, or even I, could draw one of the thought process I go through in selecting every item I purchase, I don’t really have a physical grocery-item-selection flowchart. But I do obsess. It weighs on me and takes a toll. Shopping is no breezy task. The health of the environment rests heavily on my shoulders. I am of the “we are all complicit” school of thought. Furthermore, good intentions are just not working. New atmospheric carbon levels were just recorded this week. How depressing. And due to the storms and saturated ground, it was either two trees or our humble abode. The trees were coming down with or without help, so though it is always painful, I reluctantly gave the thumbs up to have them removed. The last time I resisted tree-removal too long it almost cost our neighbors their humble abode. None of this is fun! Amazingly enough, I enjoy eating and drinking and don’t worry much about calories. Once the food is on my plate, I live for the moment. But I’m convinced that I take food far too seriously. How can that be? Without food, living things die. The return of fun: I enjoy drinking local beer (and Belgian beer as well, so I am not a purist.) Maybe it is only a symbolic gesture, but I am once again starting a garden this spring. 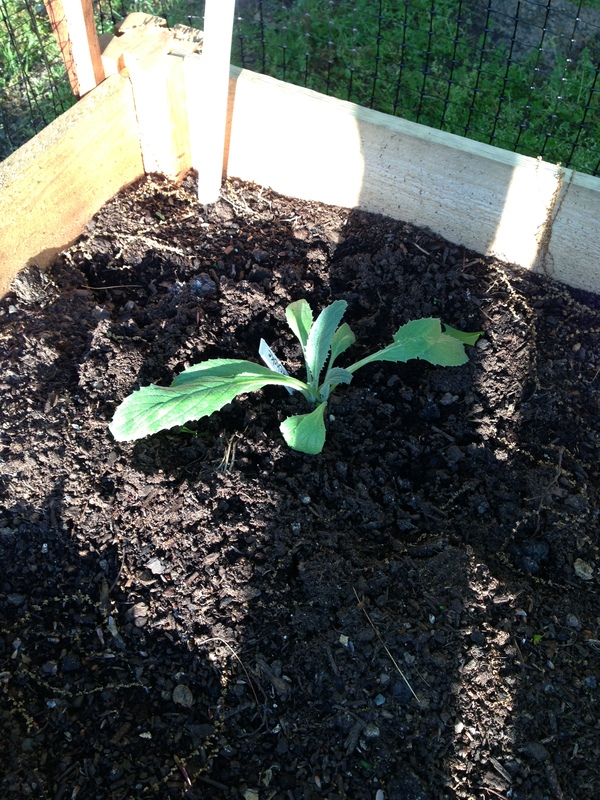 Thus far, the most exciting and bizarre thing I have going is one artichoke plant. The peas are doing beautifully, as is the Romaine lettuce. I promise not to deprive my local health food store of business, as the rabbits may eat it all, and I have no livestock on the premises, nor the ability to grow spices from the far east or tropical fruit–yet. Maybe, just maybe, I hope, my little raised bed gardens will reduce the number of trips I make to the store and the packaging and transporting of our food. Why must every head of lettuce, cilantro, parsley, arugula, spinach, collards or kale have a paper and metal band wrapped around it? Yes, I feel completely helpless regarding the building of dams in China and even more so about the draining of the Colorado River. I’m certain that the rain that falls unbidden from the skies and my lone artichoke hold the key to saving the world. Then I recognize the risk that my artichoke, lettuce, peas, and rich soil of home-cooked compost are just lulling me into complacency, as my neighbor is lulled by driving her Prius or Tesla. Circe does lulling well, and the results are generally not gratifying. Are we all lulling one another? This entry was posted in Uncategorized and tagged artichoke, ethics, food, garden, Prius, sustainable, sustainable living, Tesla, water, water rights on 2013/05/14 by Circe.